Because you and your colleagues are on the front-lines of addressing the needs of adolescents and their families through your network of educators, counselors, school nurses and/or advisors, you have an opportunity to directly connect with families. This resource is a basic letter that you can tailor to reach out to parents and families. Inform parents about things that your school, community program, etc. 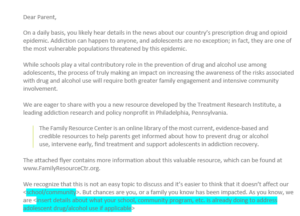 is already doing to address adolescent drug/alcohol use if applicable. If you don’t have a program in place, acknowledge your efforts to ensure the health and safety of all students. Download this word document and edit the letter so it addresses parents in your school, community, etc. Distribute it at the start of the school year/orientation, parent-teacher days, special programs, newsletter or special mailing to families. This letter could come from the school guidance counselor, school nurse, principal, a teacher advocate, parent/teacher organization, etc.